If you are looking for an anti-inflammatory smoothie with a wonderfully unique and delicious taste, this one is for you. Inspired by ultra-marathoner Scott Jurek’s Strawburst Anti-Inflammatory Smoothie, this vibrant drink is the perfect conclusion to a crisp morning workout. By combining the anti-inflammatory powers of berries, turmeric, miso, and moringa, your muscles will surely be feeling happy and thank you for treating them so well. 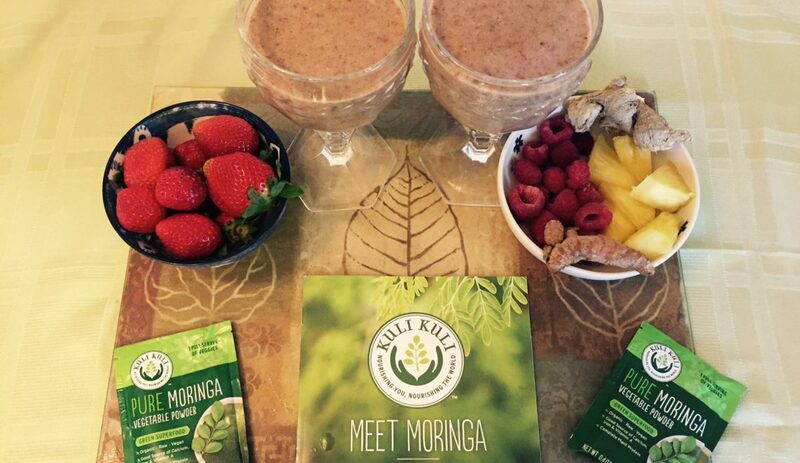 If you’d like to learn more about moringa’s anti-inflammatory properties, be sure to check out our recent blog article: Moringa as an Anti-Inflammatory and Why Inflammation is Harmful! If you don’t have access to ginger or turmeric root you can substitute them with the dried form found in the spice section of most grocery stores. Does this smoothie really call for miso? In the suggestions it says to use flaxseeds. I’m guessing that this is a typo and it’s suppose to say 1 T flaxseed instead of 1 T miso? I wanted to make this and then got kind of grossed out when it said miso. Don’t get me wrong, I love miso. I just drank a cup for breakfast. I’m a believer that miso helps me get better when I’m sick. But mixed into a fruit smoothie doesn’t sound so appetizing. The miso does seem to be a typo! Thanks for pointing it out. We quite agree – miso is great, but maybe not in a fruit smoothie!